As you enter your 50s and 60s, managing gray hair becomes a way of life -- but it doesn't have to be boring. 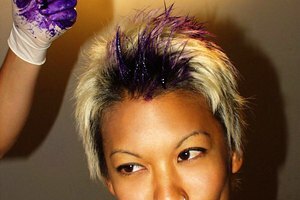 Affordable home box dye kits include everything you need to color your hair on your own. However, for best results work with a professional stylist to maintain healthy hair and help you achieve hair color that works with your skin tone. Black hair color may be an easy, low-key choice if black is your original hair color, and people are used to seeing you with black hair. Most hair color brands offer jet black and off black tones. Choose jet black for striking blue-black hair. Off black on the other hand, will give you a softer and more natural black look. If you like the idea of black but want to add a little creativity to your look, ask your stylist for brown or reddish highlights when she colors your hair. Choose brown tones when you want a softer alternative to black hair. Depending on your skin tone and preferences, you can choose from a range of brown tones from brownish-black to light brown. If your natural color is dark brown or natural black, then brown hair color may seem like a subtle change, but don't forget to treat it as you would any colored hair, and condition it regularly to prevent dryness. One of the benefits of choosing red is that you have a natural option in hair dye because henna, the world's oldest natural hair dye only comes in red. Henna is a powdered herb with conditioning properties that deposits permanent color onto hair strands without damaging side effects like chemical hair dyes. However, henna can't be lifted or stripped out of hair, so if you get tired of it, your only choice is to grow your hair out. If a large percentage of your hair is gray, and you have always wanted to go blond, your 50s or 60s can be the perfect time to give this color a try. Blond hair color can damage dark hair because it takes a double chemical process to strip out dark pigment and deposit blond hair color. For those with a lot of gray or white hair, however, the coloring process can be less damaging. An added benefit is that white roots won't show as quickly as they do when you have dark hair.